photo radar is about the money, not safety. In a report to the city’s protection and community services committee recommending city hall renew its photo enforcement contract, the city’s bean counters rejected the option of adding more traffic cops to the streets as an alternative to photo enforcement because they say it would cut into the city’s traffic enforcement profits. They drew that conclusion even though they admit in the report that real cops on the streets provide a greater presence and allow better coverage of the city than photo enforcement. 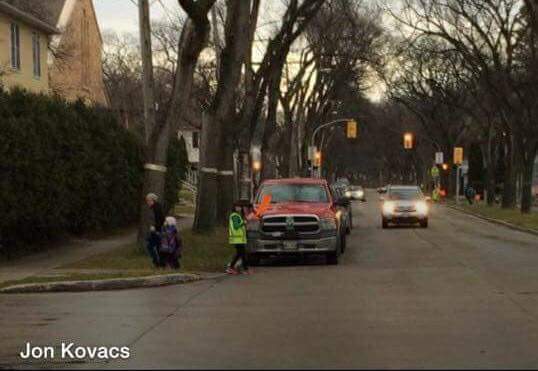 “Conducting traffic enforcement by officers provides a greater presence on the streets, and allows complete coverage in the city of Winnipeg as traditional enforcement is not restricted to school and construction zones as under photo enforcement,” the report says. There it is, in black and white. The bureaucrats agree having more traffic cops on the street provides better coverage and a greater presence yet they reject that option solely on the grounds that real cops on the street would cut into the city’s profits. The background to this is that administration was instructed months ago to examine whether putting more dedicated traffic officers on the street might be a better alternative to photo enforcement. The problem with doing that — at least for the bureaucrats — is real cops doing traffic doesn’t make nearly as much money for the city as photo enforcement does. So city councillors will have to decide whether they want to make money from automated ticket dispensers or enhance public safety. It’s now a clear choice laid out by city officials. Meanwhile, what the report failed to mention is that more traffic cops on the street doesn’t just improve coverage across the city and create a greater presence. Traffic cops perform a myriad of duties that photo enforcement simply can’t do. Not only can traffic cops stop a vehicle for speeding and running red lights, they can pull motorists over for infractions like running a stop sign or driving erratically. Photo enforcement can’t do that. Also, once the officer has pulled over a vehicle, they can check for impaired driving, licence and registration infractions, stolen vehicles, etc. Photo enforcement can’t do that either. What we do know about photo radar is that there is no data whatsoever that shows it has reduced collisions or injuries. There’s no data on it because police have never kept crash data on photo radar. There is conflicting data available for red-light cameras. Some of the data published by Manitoba Public Insurance has shown collisions have increased at most intersections where red-light cameras have been installed. Other police reported data shows some collisions have decreased, although those statistics are incomplete because not all collisions are reported to police. At best, red-light camera data is inconclusive, and at worst it shows collisions have increased. And city officials say this has made our streets safer? What they really mean — and it’s now in writing — is that photo enforcement has made the city treasury richer. It hasn’t made streets safer, but it has generated lucrative profits. City council will now have to choose between money or traffic safety, which should really be a no-brainer. 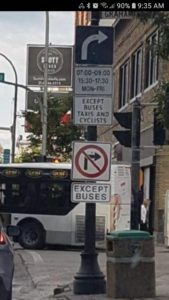 Look at the signs on the right and think about it… The top signs say the lane must turn within the specific hours, but the bottom sign says no right turn. The city clearly doesn’t take signage seriously?